It’s no secret that I’ve recently been drinking quite a wide variety of herbal teas. Hibiscus tea, fennel tea, and matcha green tea are the three that I’ve been enjoying the most. Considering I’ve already written about the other two types, I thought it was only fitting to do a write-up for matcha green tea and recommend some of my favorite matcha green tea powders. There’s no shortage of powders available out there, and unfortunately not all of them are high quality. Some of the tea powders I tried tasted rather bland, others had a foul odor, and some even produced a weird yellow color when brewed. That’s why I’m going to share with you five different options for the best matcha green tea powder in this article. They all make a high quality, delicious tea that I’m sure will satisfy tea lovers everywhere. For the purpose of brevity, here are the top matcha green tea powder we reviewed in this post. Before we get into that though, let’s briefly go over why you should be drinking matcha green tea in the first place. Some of you may be wondering just what exactly matcha green tea powder is, and how it differs from regular green tea. When you brew green tea, you typically use a tea bag containing the leaves of the Camellia Sinensis plant. When you prepare green tea in this manner, you’re only gaining a fraction of the benefits that the leaves can provide. Matcha green tea powder, on the other hand, is made by grinding green tea leaves into a fine powder. When you brew your tea with matcha powder, you’re able to get 100% of the health benefits contained within the leaves. Due to this, matcha green tea is much more concentrated than regular green tea, and therefore requires a smaller amount per cup. What are the Benefits of Drinking Matcha Green Tea? One cup of green tea per day is an excellent way to help your body ward off chronic diseases such as cancer. Green tea is packed full of potent antioxidants https://www.ncbi.nlm.nih.gov/pmc/articles/PMC3679539/. Of the these antioxidants, the most notable compounds that green tea contains are known as catechins. Matcha green tea contains as much as five times the amount of l-theanine as standard brewed teas. It’s such an effective cognitive booster that it’s actually sold as a stand alone nootropic product as well. Matcha green tea has been found to help your body burn fat at a rate about four times faster than the average. The most important thing to note however is this metabolism-boosting effect is gained completely naturally, meaning there is no associated side effects compared to other pharmaceutical brand fat burners on the market. While matcha green tea does indeed contain a bit of caffeine, you’ll end up receiving the vast majority of the energy-boosting benefits thanks to its other nutritional properties. It’s a combination of effects all taking place at once — the antioxidants, amino acids, vitamins, and minerals are all giving your body the essential nutrients that it needs to function properly. Drinking matcha green tea is effective at lowering cholesterol in your body and therefore helping to reduce your risk of developing heart disease. Ever since I started drinking more types of herbal teas, I’ve noticed that I haven’t come down with a single cold or flu. This is surprising because I usually get hit hard every year around the holiday season. It turns out that the tea is indeed responsible, particularly the matcha green tea. Unlike many so-called “detox” products available on store shelves, green tea is an all natural beverage that is indeed highly effective when it comes to helping your liver handle the detoxification process. The final benefit of drinking matcha green tea that I want to discuss is also one of my favorites — it provides some fantastic anti-aging benefits. It’s widely considered to be the absolute best anti-aging beverage in the world. The antioxidant content of green tea helps to protect telomeres (DNA sequences found at the end of chromosomes) from the oxidative damage that is caused by the natural aging process. https://www.ncbi.nlm.nih.gov/pmc/articles/PMC4419223/ What this essentially means is green tea helps to ward off the ill effects of aging by keeping your body young on a cellular level. Here are five of my personal favorite matcha green tea powders that I’m sure you will love. I’ve tried a LOT of different matcha teas and each of the following five choices are all of a considerable higher quality than most options out there. All five of these matcha green tea powders can be ordered directly from Amazon as well. The first matcha green tea powder that we’ll be looking at is made by the company Jade Leaf. They source their matcha directly from organic farms in Uji, Japan ensuring that their green tea powder is of the highest quality. There’s absolutely no additives in this powder whatsoever — it’s completely gluten-free and vegan-friendly. 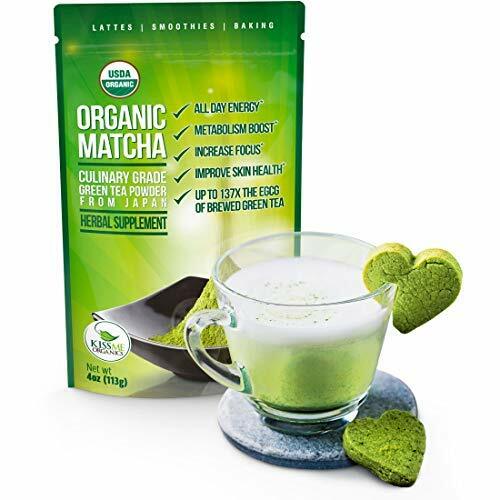 The matcha powder is of culinary quality and it’s excellent not only for making tea, but also as an ingredient in smoothies and baked goods as well. Jade Leaf offers a 100% money back guarantee if you aren’t totally satisfied with your purchase. This green tea powder has quite a strong taste — it’s less noticeable in smoothies or lattes but when making green tea some people may be put off by how strong it is. 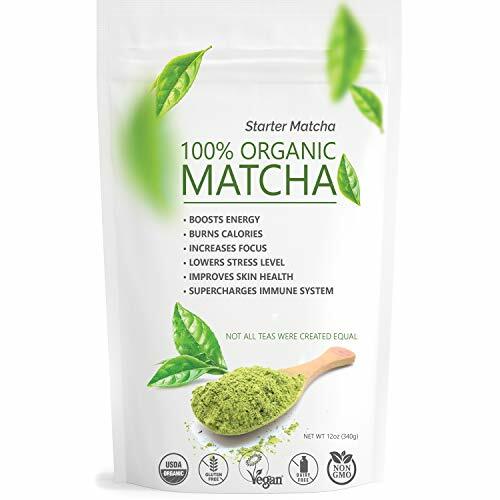 The next powder that I recommend is this 100% organic matcha produced by Starter Matcha. I really enjoyed this matcha green tea powder, as even though it contains less coffee than your average cup of coffee, it gave me quite a nice boost in the mornings to help me get my day started. And the best part was that the energy boost wasn’t followed by the usual crash I get when drinking coffee. Excellent all natural energy boost that lasted close to six hours with no crash. Another organic, vegan, and totally gluten-free matcha powder. Excellent price range — you get quite a lot of matcha powder per dollar spent! While I personally enjoy the immense boost of energy this green tea provides, it may be too strong for some people — I’d recommend halving the dose if you are sensitive to stimulants. The third matcha green tea I absolutely love is another product sourced from Japan. It’s made by Zen Spirit and the powder is culinary grade, making it ideal for a wide variety of recipes. I always like buying from Zen Spirit as well because I find their customer service to be top notch. They include an ebook with 10 matcha recipes with every purchase — some of them are truly delicious! I felt noticeably calmer when drinking matcha green tea when making it with this powder. Has a wonderfully distinct fresh taste compared to the other recommendations — when it comes to pure flavor, this is my preferred choice. It’s fairly expensive when compared with the other recommendations on this list. Next up is this great matcha powder from Kiss Me Organics. They are another company that sources their matcha directly from Japan and put it through strict third-party lab testing protocols to ensure only the best quality. Kiss Me Organics has a tremendous focus on being eco-friendly, and this powder proves it by being packaged in a chemical-free, BPA-free airtight packaging that helps keep the powder fresh for longer. This matcha gives me quite a nice boost in focus — perfect for those periods of time where I need to be productive! Kiss Me Organics doesn’t just offer a 100% money-back guarantee; they offer you a lifetime satisfaction guarantee with all of their products. While this matcha powder is fantastic when it comes to providing energy and focus, it does have a rather bland taste. The final matcha green tea powder that I highly recommend is made by TEAki Hut, and as you might guess from their company name, they know what they’re doing when it comes to making high quality tea. This organic matcha has a clean, fresh taste that I found gave me noticeable energy and focus for hours. 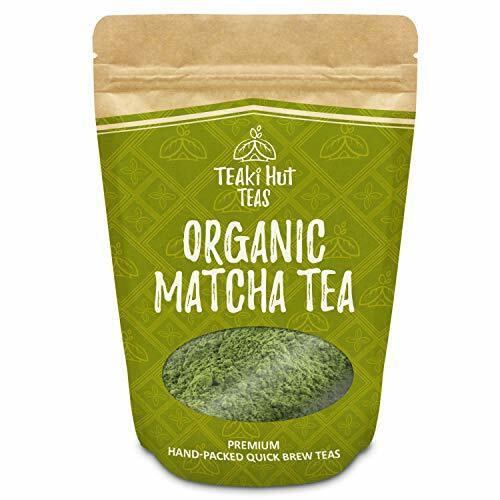 TEAki Hut also packages their matcha powder in an airtight BPA-free bag to keep it fresh for longer. I found this green tea gave me excellent boosts in both focus and energy levels that lasted throughout the day. Has a deliciously sweet taste that’s excellent for making tea, lattes, smoothies, and baked goods. The matcha powder has a much darker coloring than the other recommendations listed, which is normally a sign of a lower quality and may put some people off. While I absolutely loved all five of the above matcha green tea powders, my top pick would have to be the TEAki Hut Organic Matcha Green Tea Powder. Yes, it brews a green tea that has a much darker coloring than the other powders provide with their crisp, bright tints, and that is generally a sign of low grade matcha. Don’t let the color fool you though — this matcha powder tastes great and the focus and energy boosts I got from drinking it were tremendous! 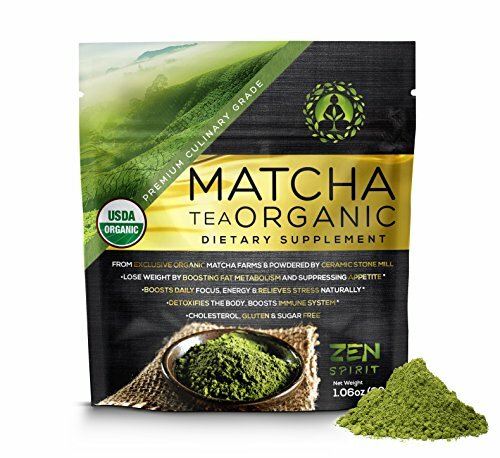 On the other hand, if you’re just looking to get a matcha powder that has a phenomenal taste, I’d definitely recommend the Zen Spirit Organic Matcha Tea. 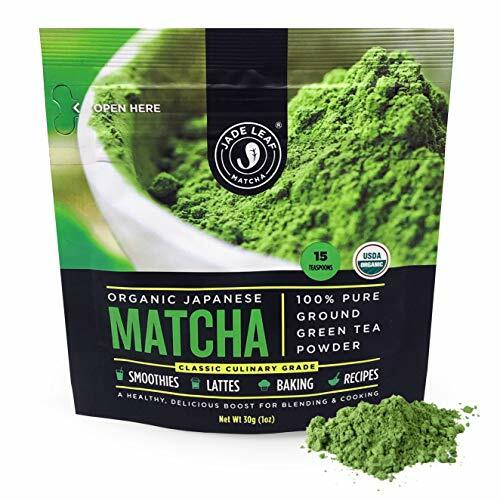 It’s the best tasting powder out of the above five, although when it comes to an overall pick, it doesn’t quite edge out the TEAki Hut matcha powder. Have you tried any of the above matcha green tea powders? Do you prefer a product that’s not featured above? Tell us about down in the comments and we’ll try it out! Also, please feel free to share this article with your friends and family, especially if they love matcha green tea!